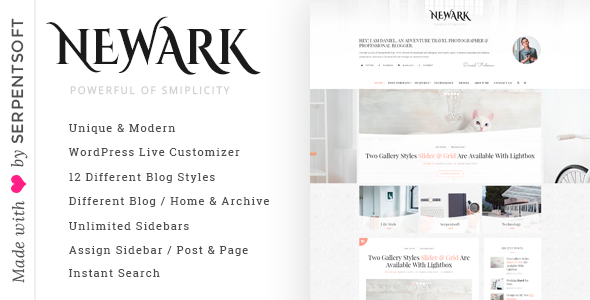 Newark is an amazing personal blog that have a lot and amazing features for bloggers and professional writers, it using WordPress live customizer that helping you to see the changes you made immediately with an amazing new feature called AJAX that let you change theme’s colors without re-load the pages. Newark helping you to build a clean, minimal, writing and personal blog because of its features make it readable on all devices and smartphones as well as instant search which let your users see their search instantly which all people including bloggers, writers and travelers who captured a professional photos and make their galleries love it as well, Your social networks icons also appears in the header so it’ll increase your social networks fans, However with stylish new blog, amazing design and typography you can build one of the best personal blog in the web will made read articles in mobile devices very comfortable. With WordPress Live Customizer you can watch your modifications instantly without reload website’s pages every time, with extended options and AJAX you can styling and coloring your writing blog without loading or even waiting a second. With fully responsive feature helps your customers to read your personal blog articles very easily on tablet and small phones as well as provide two logos versions the normal one and the retina logo with sharp icons your social icons appears very sharp on retina devices. Very useful feature for blogging websites available here is Instant Search that helps your customers to find target posts or pages instantly without reload the page which is very useful for any writing blog and of course the normal search is available too and you can switch between them. Slider area is the most important part of any personal blog and travel blog, The Newark’s featured slider gives you the ability to display the most recent posts, select a Certain Category or you can Specify The Posts you want to display by its ID separated by comma. An amazing feature included with Newark, That you can select from 75 social icons and add it Underneath Main Logo, Blogger Widget, Social Icons Widget and in the Footer. Each one can sorted separably which give you the full control for your website and also available in three different styles. Yes, That’s right .. We provide Twelve Different Blog Styles to create an amazing writing blog the Classic, Sections (Grid) is a new style with ability to customize the number of posts for each section grid, First Full then Grid, Grid Style, First Full then List, List style and finally the Masonry grid styles available in two and three columns. Newark’s WordPress Theme has a unique amazing feature, We give you the ability to discrimination each archive page (Category, Tag, Archive, Search, Author) with a different blog style which give you the full control of your personal blog and make your customers enjoy with your website. Another amazing feature in Newark is ability to add infinity sidebars and we give you the ability to discrimination each Post, Page, and Archive page (Category, Tag, Archive, Search, Author) with a different sidebar which has different widgets. Sticky Sidebars is one of the most amazing features you should have while blogging and that’s because it’ll increase your Ads CTR so it’ll increase your profit margin, Just put an Ad widget at the bottom of your sidebar and watch the new CTR rate. Newark Developed to make your writing blog in the first positions in search engines with HTML5 and Schema as well as using appropriate headers so search engines can understand your personal blog’s parts and speed up indexation therefore blog’s rank. Newark has another Unique feature that you can select from the most top 10 social networks, the share icons that will appear in blogging Item or (Post, Page) .. With this feature the blog items will have share icons other than that in (Post, Page) pages. Newark has two gallery styles Slider that has a full images and another one is Grid Style that will help you to display your personal photos in amazing view, Both have Lightbox that will display the full image size when you click on it and turn your writing blog into and amazing one. Newark come with an amazing plugin from Serpentsoft that let you create chat post very easily and coloring it without write any code, Just add new post select Chat post then add chat items .. you can also reorder or delete chat items at any time. With MailChimp WordPress Plugin you can increase your customers base by subscription then send e-mails to them immediately. Just Sign-up in MailChimp to get your API Key then paste it and prepare your widget form. ContactForm7 WordPress Plugin helps your visitors to send mail to you, You can customize the form and the mail contents flexibly with simple markup. The form supports Ajax-powered submitting, CAPTCHA, Akismet spam filtering and so on. We provide outstanding support with extensive documentation helps you to know every feature in the entire theme, You can use support comment form to send us your question. FIXED: Color Picker tool in WordPress v4.9. FIXED: Smart Fixed Menu in all devices. FIXED: Some Responsive and Mobile devices issues. NEW: Snapchat Social Network Added. NEW: Snapchat Social Network for Users Metas. Fixed: Sticky Menu in boxed layout.